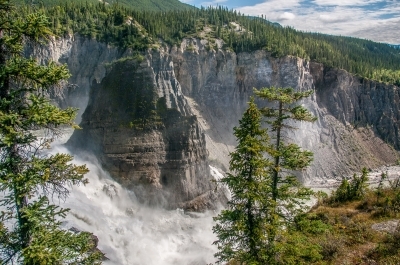 Nahanni National Park Reserve is an undisturbed river, canyon and cave landscape. It is the breeding habitat of four endangered species: peregrine falcons, golden eagles, bald eagles and trumpeter swans. The park is located in the Northwest Territories of Canada and sees only about 5000 visitors a year. The centrepiece of the park is the South Nahanni River. Four great canyons, called First, Second, Third and Fourth Canyon, line this spectacular whitewater river. Nahanni National Park might very well be the greatest national park in the world. That is a big statement, but anyone who has been to Nahanni (and few people have) can back it up. Nahanni is home to one of the world's largest waterfalls (Virginia Falls) which is higher than Niagara Falls and has a flow comparable with Victoria Falls in Africa. That alone would be enough to make it a world heritage sites. However, it is also home to the Cirque du Unclimables, which is a stunning collection of mountain peaks, and the Ram Canyon, which is one of the most impressive canyons in the world. 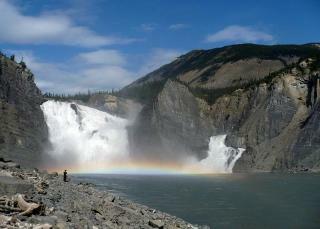 Nahanni only gets about 800 visitors per year. There are no roads to the park, so the only way to enter is by hiking or float plane. There is also a very short season of about 2 months where visitors can enter. Read more from Gary Arndt here. It has been almost twenty years since I had the awe-inspiring and quite humbling experience of sticking my (and my buddy's) canoe into the river and wending down one of the most beautiful spots one could imagine on earth. For the first three days after the plane dropped us off, we (veterans of canoe/kayak trips much longer than this one) were like tourists -- gawking agape at the size, beauty, and power of the river, its attendant mountain peaks, and the furry/feathered creatures that called this jewel home. It was, and is, like nothing I had seen before or since. Enjoy your trip to this wilderness paradise! Legends and Folk Myths: Deadmen Valley: "the area is long known for having people disappear only to turn up without their heads"